Boy Scout patches are an important part of Scouting culture, but sewing them on a uniform can be a bit of a challenge. The thick materials and stiff fabric can be difficult to work with, but a few tricks can help make the process easier. There are specific guidelines regarding placement of the badges on a Scout's uniform. 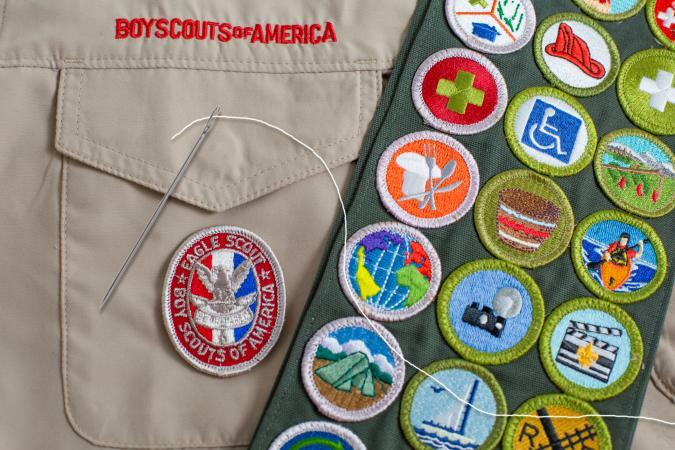 Before you begin to sew, take a look at patch placement requirements for Cub Scouts and Boy Scouts. Research specific requirements for Brownies and Girl Scouts too. Before you start sewing, you'll also need to choose a thread color that matches the decorative stitching that finishes the edge of the badge. You can take the badge to the fabric store and look at the thread options there. By holding it up to the thread selection, you can find a thread color that's nearly a perfect match. Alternatively, you can use clear monofilament to sew the patch with almost invisible thread. However, this may not be as durable as traditional thread. The advantage is that you can keep it on hand and be ready to sew any badge without a trip to the fabric store. According to ScoutmasterCG, the easiest way to sew badges is by hand. This doesn't take long, and you don't have to be an expert seamstress to do a neat, professional-looking job. In addition to the badge, thread, and uniform, you'll need a small hand sewing needle, a washable glue stick, an embroidery hoop, and a pair of scissors. Position the badge on the uniform in the correct place. Use a washable glue stick to secure it while you sew. Place the area you'll be sewing in an embroidery hoop to keep the fabric flat and make it easier to handle. Thread the needle. A small needle works best because it's easy to maneuver. Tie the two ends of the thread together to make a double length of thread. This makes your work stronger. Trim the ends of the thread so you have just the knot. Slip the needle under the edge of the badge and catch some of the edge stitches. This will hide the knot of your thread between the badge and the uniform. Now, simply sew around the edge of the badge, catching threads from the edge and bringing the needle down to catch some fabric of the uniform. You should not need to go through the thickness of the badge itself, just the decorative stitching at the edge. Continue all the way around until the badge is completely attached. Knot the thread by sewing up and down in the same place several times. Cut the end and check to make sure the badge is securely attached. Sewing a patch by machine is trickier, but it's a faster process if you need to do many of them. You'll need most of the same materials and tools as you used for hand sewing, but you'll replace the embroidery hoop and hand sewing needle with a sewing machine. Make sure your machine can handle heavy-duty sewing since the patch is very thick. Use the washable glue stick to affix the patch while you work. This keeps it from moving around under your sewing machine foot. Set your machine to a zigzag stitch after threading it with the appropriate color. Position the patch and uniform so the needle is right over the colored edge stitched. Lower the foot, and using the slowest speed you can, carefully sew around the edge of the patch. Backstitch at the beginning and end of sewing to secure the thread. Remember, your Scout may need to have this patch removed and replaced with another one, so it's important to balance durability with ease of removal later. As long as you work carefully, it will be easy to cut the stitches with a seam ripper at a later time. This is also something to consider when choosing the glue stick for securing the patch before you sew. Double check that it's washable glue; otherwise, you may have a permanent patch that could be problematic later. Sewing patches is a great way to celebrate a Scout's accomplishments and support his or her hard work. Take your time and work carefully, and you'll find the patch looks perfect on that uniform.